Guess whooooo is here today? Go on . . . guess whooooo it is. 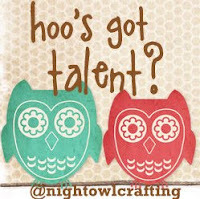 Leslie from Night OWL Crafting. Did you get my little joke? Okay, I'm not as funny as I think I am. I'll stop now and just turn it over to Leslie. 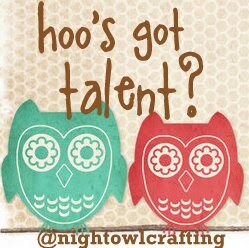 HELLLLLLLLOOOOOO Twelve Crafts Till Christmas followers! I am so excited that Elizabeth invited me to join in on this fabulous Twelve Plus Days of Traditions! Let me introduce myself! 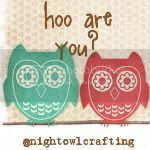 My name is Leslie and I am the creator of Night Owl Crafting! 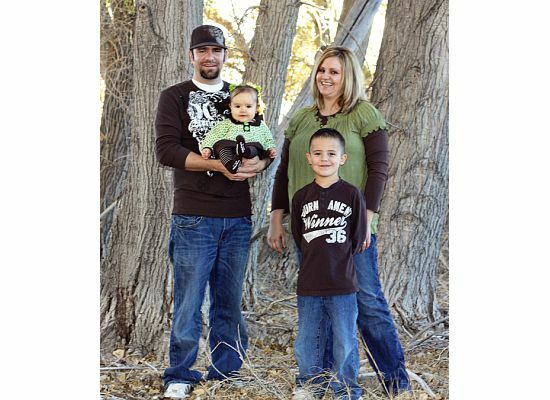 I am the mother of 2 children and one on the way! 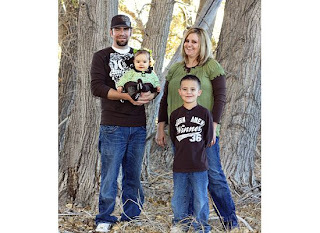 I have an eight year old boy and a 1 1/2 year old girl. I am a high school teacher of students with special needs! I am married to a wonderful man who is a great father and husband. I love to craft and in the little spare time that I have I take the opportunity to try and be crafty! This is where my blog comes into play! I have 2 link parties a week! The first one is on Tuesdays and it is called . . . This party is where you answer a few questions I ask each week and then link up your post! This is a party to get to know each other outside the craft world! The other one is held every Wednesday and it is called . . . This link party is where you can come and show off whatever you have been making! I hope you will come and link up to both parties! I also try to show off my craftiness 2 to 3 days a week! Today I would like to share a holiday tradition that my family does every year! Every year we select one or two families to do the 12 days of Christmas for. We try not to let them know that it is us. We wrap our gifts, leave them on their doorstep, knock, and then run. We have so much fun trying to not get caught! It has taught my siblings and I the true meaning of giving during the Christmas season. I wanted to share the sayings that we put on each package last year! we hope that it will give you strength, for busy days ahead. to help you wrap your presents for that very special date. the light dessert, the bright dessert, RED, GREEN, and YELLOW! and so we thought we'd give you 4 rolls of tissue! we thought it might be handy. you haven't got a clue! we bring you holly balls! even Elves begin to wane! a bunch of candy canes. we bring you a candle. we think you're pretty neat! for stockings and a treat. for letting us be your Secret Elves! Some of them we didn't do what it said and we switched them up to fit the families better. We never revealed ourselves on the last day, instead we got each family member a present and put it in a Santa bag! There are so many different ways that you can do the 12 days of Christmas for a family or friend in need! Thanks Elizabeth for letting me share part of our holiday traditions! Thanks for sharing this amazing idea Leslie! I'm already brainstorming families that we can "adopt" for this project. How do you serve others during the holiday? Write a post about it and link up below so that we can all be inspired! How fun and I love the rhymes! I just started listening to Christmas music today and I am completely okay with never hearing the Twelve Days of Christmas song. :) Your rhymes are SO much better! I love this tradition!! What a great way to involve your whole family in the spirit of giving! Oh this is so sweet!! I love surprising people with things - what a great idea to do it at Christmas!